SEO is simpler than many would have you believe, the mystery is in the subtle behind-the-scenes changes. But we have pulled back the curtain to let you see that it isn’t as scary as you may have first thought. The key to succeeding online is simple; everything you do online has to revolve around your SEO/Marketing Strategy. You may love the look of your website, you may love the images or the words you have used. You may have plenty of wonderful widgets and gizmos on your site but it won’t count for a thing if no one can find it. It’s a bit like having a billboard out in the desert. Our strategy is simple. Once we establish what traffic you want, we build or edit your site accordingly. 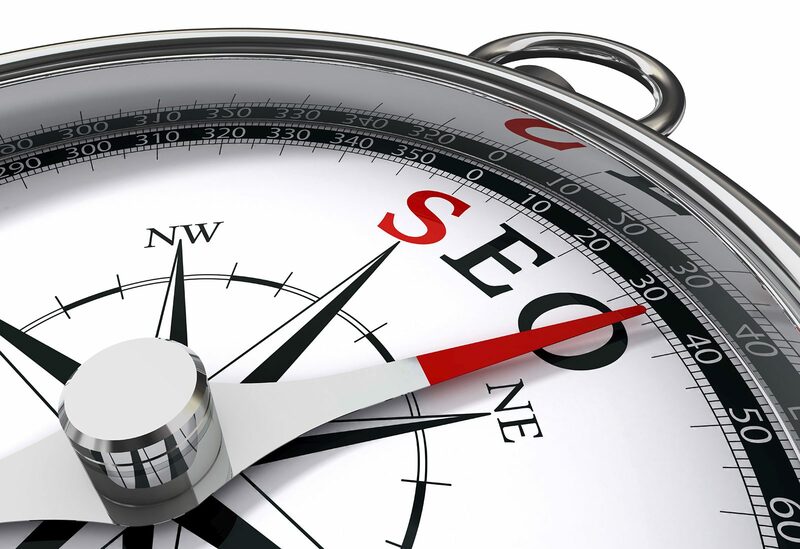 Our SEO strategy leads the way and everything else follows. With every plan we provide you with a team of 4 specialists. The SEO Team Leader directs your online strategy. The Team Leader directs the 3 other team members with what needs to be done. Don’t worry; we understand every change is subject to your approval. Once you give us the go ahead, we then implement these changes progressively over a period of a few weeks to a few months depending on the scope of the changes you want made. Just remember though that patience is the key and we focus upon organic changes to the site and project that you bring us. By making progressive subtle changes and implementing the improvements over time, Search Engines will be more receptive to the change, and your visibility will steadily improve. Our strategy to online success is simple. Dominate the first page of Google. 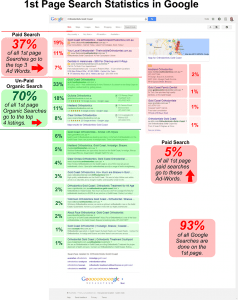 In case you are wondering – the first page of Google gets 93% of all the traffic. Google AdWords gets 42% of the 1st page traffic. The rest highlighted in green is what is known as the organic search traffic. 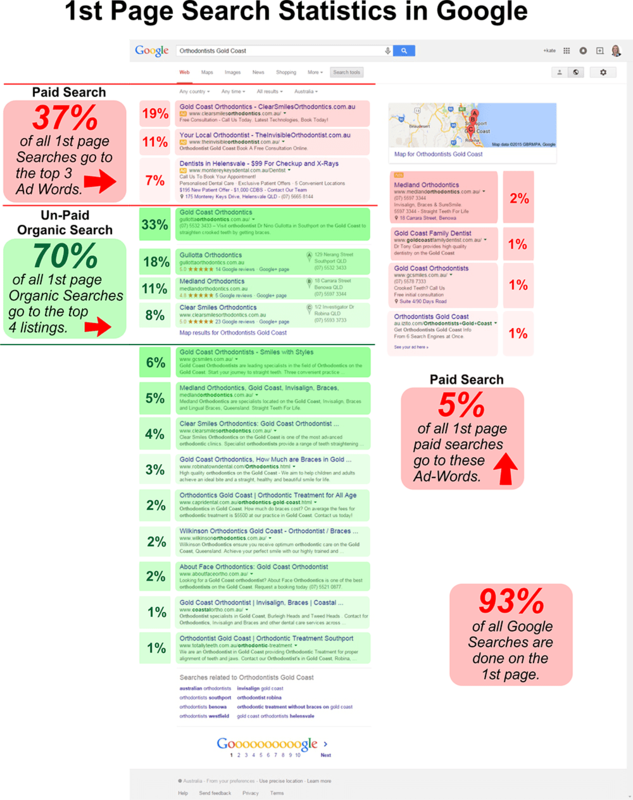 The 1st organic unpaid listing in Google gets 33% of all organic search traffic, the second gets 18% and so on. Please note these statistics are based on all the research we could get our hands on, as you can understand Google keeps a lid on much of this data. If you want to have a good SEO strategy then get one website ranking well on the first page of Google with an AdWords campaign. If you want to increase your AdWords traffic from 19% to 30% then run two campaigns from different sites (the ultimate split test). If you want to increase your organic traffic from 33% to 51% then build another website. Once that works wonderfully for you then do it again. Keyword research is an important focus for allowing people to find your website through the specific search criteria that they are looking for. The focus for us is on the important balance between the Broad “Ego” Keywords, and the long tail “Money” keywords so that we can bring people to your site who want to actively engage with the services you are offering. 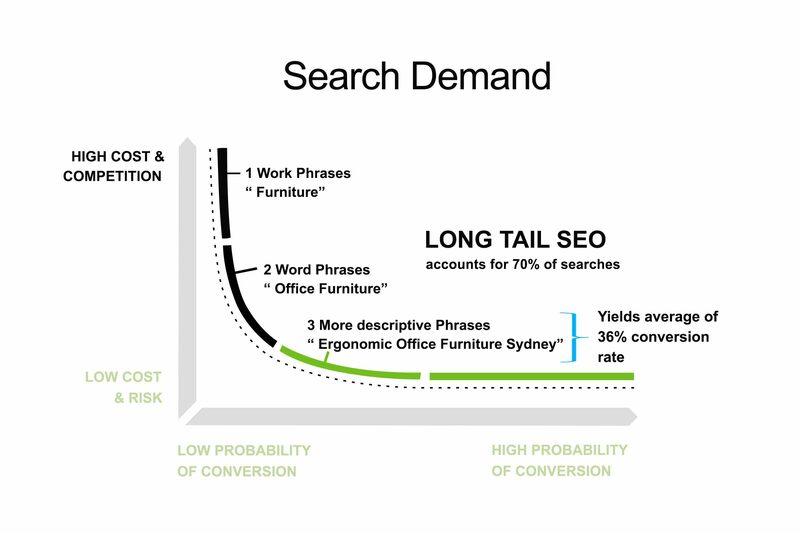 To find out more about the keyword services, techniques and consideration, we have a comprehensive discussion here. Our on-site SEO applications are in applying the keyword research into the physical application of your website. This goes beyond the homepage, and helps to create broad and specialised themes for all of your pages to increase the overall visibility of your website and webpages. On-site techniques includes the creation of new content and the changes made to the existing content. Learn more about our content services here. Off-site tasks are inclusive of the improvement of your link profile. This is one of the more involved and drawn out processes because of the natural approach that needs to be taken to creating quality and reliable links to your Website. We are highly trained in the task of link acquisition and have strong connections with reliable webmasters throughout a variety of industries to ensure quality links. To find out more about the process of developing a quality link profile, and the dangers that those unaware might face, we have a comprehensive discussion here. Google Places Is another external task that is often overlooked but it is good housekeeping to provide you with both links and a greater recognition and visibility beyond the Search Engine. This task will integrate your business into areas such as Google Maps, Google + and Search. Every month we generate comprehensive reports for your revision. This maintains our accountability to you as a client while keeping you in the loop for everything that we add or change throughout your site both on-site and off-site. In addition to this, we update you on the competitive field to demonstrate how your site is tracking and where the improvements are showing results. This outlines your standing in addition to your identified competitors – this is also produced every month.